A School Bus Division provides school transportation and charter services to municipalities, school systems, and other public and private organizations. Serving large cities and small towns alike, this is one of New England's leading school bus operators, providing transport services for 12 school systems and 65,000 school children. Diesel particulate matter (PM) poses a serious health risk and according to the EPA, aggravates asthma and allergies or can cause other serious health problems including lung cancer. To reduce exposure of harmful emissions exposure to children on school buses in Westport and Plainville, Connecticut, The school bus operator installed full-wall DPFs to achieve the highest protection against PM. However, in low-temperature applications such as this, DPFs quickly collect soot, which causes the cordierite substrate pores to clog. The dry nature of the soot from EGR engines tends to exacerbate this problem, forming a hard carbon cake that only oxidizes at elevated temperatures. As the filter clogs, backpressure continues to rise until the unit is either removed and cleaned or regenerated in place. Until filters are serviced, the increased backpressure results in poor engine performance and lower fuel efficiency, increasing overall fleet operations costs. Since school bus exhaust does not run hot enough to enable passive regeneration, once the backpressure reached 5-6 psi, school bus operator would remove and bake the filters for six hours to oxidize the entrained soot. Aside from being an energy-consuming and costly process, it also required that buses be removed from service more frequently than desired. Combined with the lower fuel efficiencies and escalating diesel prices, the DPF program became more expensive than originally anticipated. Alternatively, school bus operator could have deployed an active DPF, whereby diesel fuel is injected in front of the filter and ignited to raise the temperature enough to initiate regeneration. While this does not require removal of the filter for cleaning, active systems run the risk of run-away regeneration, which can cause unacceptable consequences such as significant thermal stress. This in turn can affect substrate integrity and damage the DPF, ultimately shortening the life of the device. Run-away regeneration also creates the possibility of flames jetting out of school bus exhaust system. In addition, active systems tend to have higher upfront and operating costs, making them less attractive economically. With passive DPFs installed on the existing Westport and Plainville fleet, school bus operator sought a solution to ease its maintenance issues and operating costs while providing school systems with the healthiest environment for their children. JLM Lubricants’ Diesel Particulate Filter Cleaner (DPFC) fuel-borne catalyst acted as a “problem solver” for school bus operator, ensuring filter performance without increased costs. With a quick, straightforward installation, the buses were equipped with an onboard dosing system to automatically blend JLM DPFC with diesel fuel on the engine intake. Specifically formulated for use with DPFs, JLM DPFC delivers benefits at multiple levels. Passive and controlled regeneration are made possible at temperatures in the low 300°C range, easily achieved by the bus operators in their regular route, by either driving the bus at highway speeds or by loading the engine on uphill grades for 5-10 minutes. This activity will either dramatically reduce or eliminate cleaning requirements. 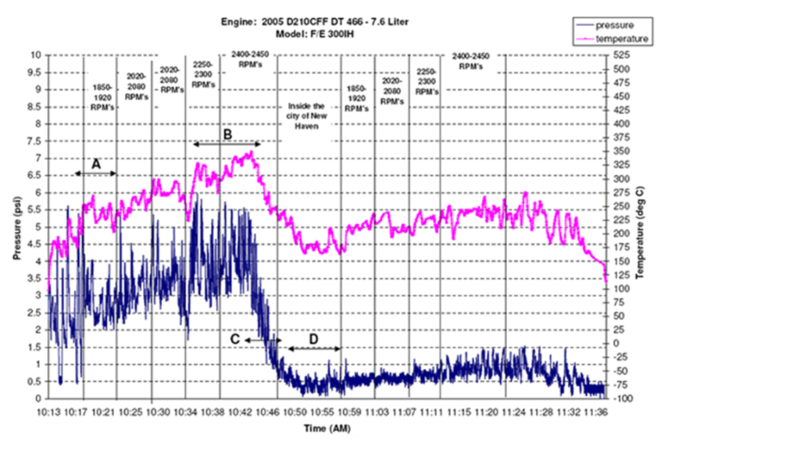 Complete regeneration of even dry soot from the EGR engines dropped backpressure from 5 psi to 0.5 psi. JLM DPFC increases the rate and completeness of combustion, thereby lowering the amount of engine-out soot by as much as 25%. This helped maintain a cleaner DPF longer, based on decreased loading; even fivemonths after passive regeneration, backpressure did not exceed 3 psi. More complete combustion and less backpressure also improved fuel economy (although specific amounts were not measured in the course of this program). Complete passive regeneration initiated by loading the engine between 2250-2450 rpm.